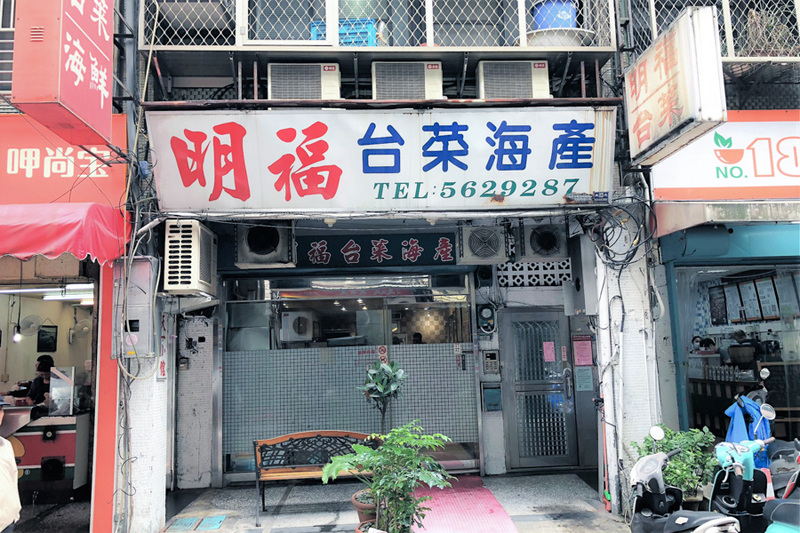 [Taipei] I read that the owners of one Michelin-starred Ming Fu 明福台菜海鮮 were so low profile and “largely uninterested” that they didn’t attend the Michelin ceremony. Food and customers come first. 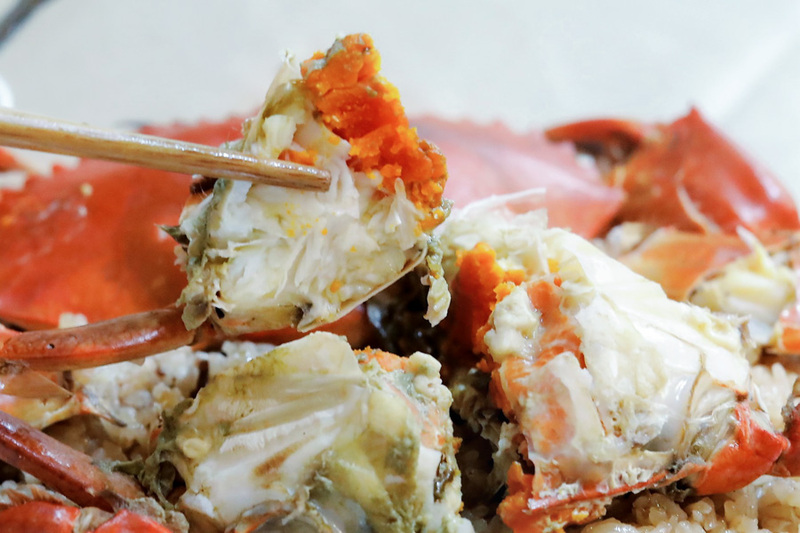 Ming Fu is a six-table Taiwanese seafood restaurant that’s worth a stop in the Zhongshan District of Taipei. 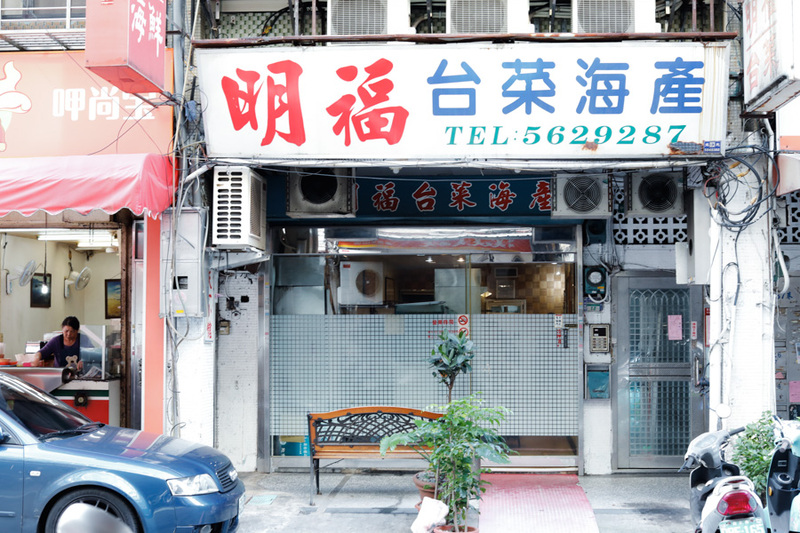 It is one of the 20 eateries recognized in the inaugural Michelin Guide for Taipei. 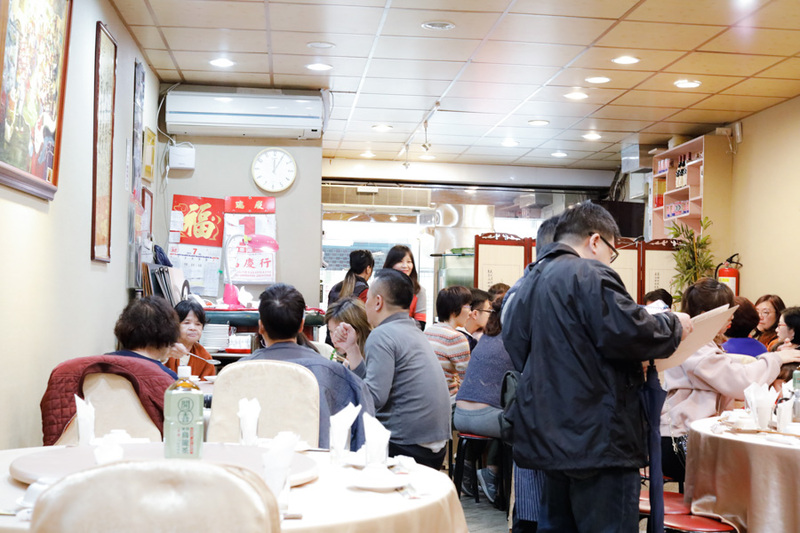 A lady next to my table was raving to her family that this was the only other Michelin-starred restaurant that offered authentic Taiwanese cuisine, the other being Golden Formosa 金蓬萊遵古台菜. 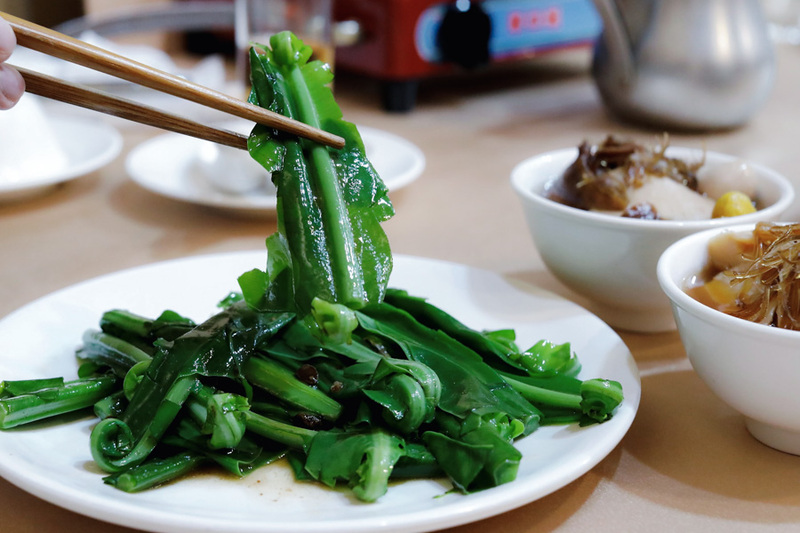 Tucked away in a nondescript alley in Zhongshan, the well-known low-key Ming Fu isn’t the most likely place to find internationally acclaimed cuisine. It is the kind of place you’d probably just walk by and not normally walk into, not realizing it is one of the best restaurants in town. My friend quipped, ”It’s here, ah?”, pointing to the rather humble-looking exterior. Since its foundation in 1976, the restaurant didn’t open a branch nor offered take-out/catering service. The husband-and-wife team that runs Ming Fu are Master Chef A Ming (阿明師), who’s in charge of the kitchen, and Lin Liju (林麗珠), who takes care of service. 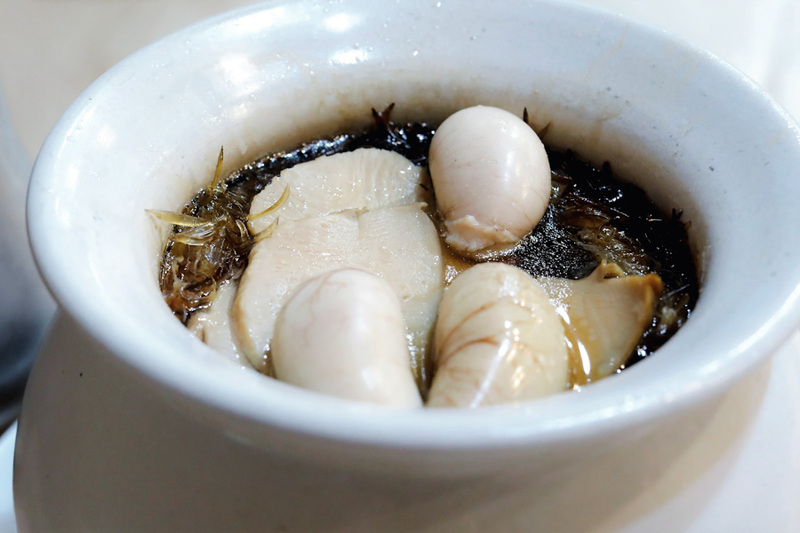 It is considered one of those cult secrets that Taiwanese-in-the-know dined at. On the wall you’d even see a photo showing the restaurant’s owner and movie director Ang Lee. The interiors have a rather simple look, just like any residential building. You could tell how long it has been in operation as the space feels quite old-fashioned. Despite its simplicity and limited space, with only 6 tables that could seat about 50 guests, you could still have a comfortable meal here. Dishes are served sans the fancy plating, beautiful colours nor expensive dinner plates. Reserve your judgment once you taste them as the chef’s efforts focus on the use of fresh ingredients to bring out the optimum flavours. The most famous dish here is Buddha Jumps Over the Wall 一品佛跳牆, which has been earning rave reviews online. This dish, which comes in 3 sizes, is so popular you must pre-order the soup when you book, to avoid disappointment. Priced at NT$3600, NT$6000, or NT$10000 (SGD159, USD117 for the smallest pot). 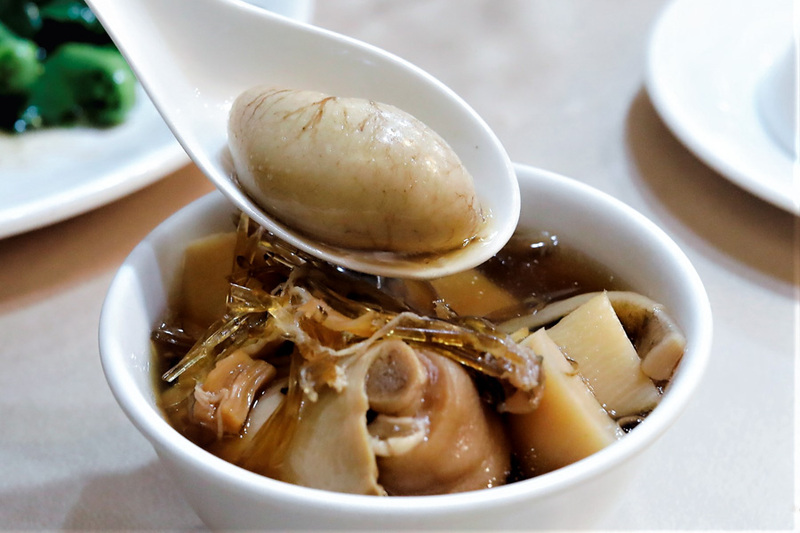 The dense and gelatinous soup ‘Buddha Jumps Over The Wall’ is a type of shark fin soup delicacy from the Fujian province of China. 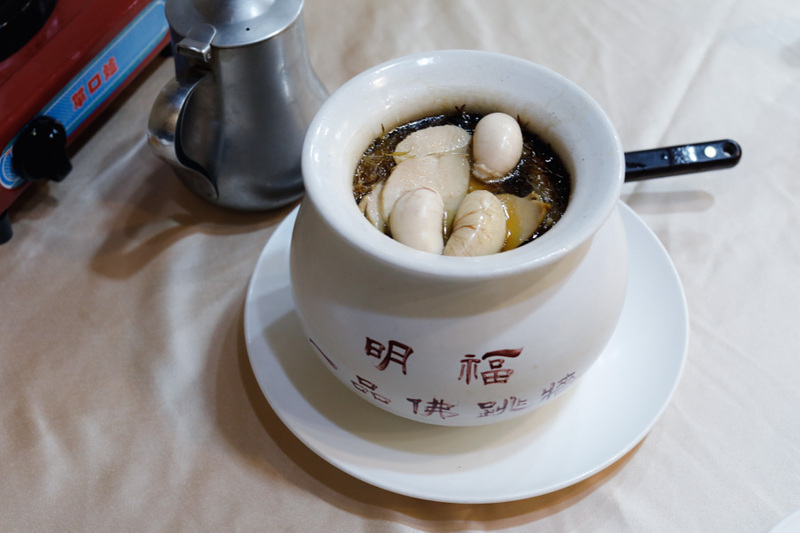 The pot is simmered for 5 hours with a slew of animal products, including shark fin, abalone, chicken, pig feet, pig stomach, plus additional ingredients such as gingko, sweet bamboo shoots, wolfberries, monkey head mushrooms, and a worm-like ingredient that’s actually Chinese artichokes. As this soup contains real shark fin, you could request the staff to omit it if you don’t eat or prefer not to eat shark fin. While I have had Buddha Jumps Over The Wall here and there (in an occasional Chinese wedding dinner), none were like this. The soup itself was like an amalgamation of the essence of all the ingredients, extremely nutritious-tasting and comforting. I thought there were too many ingredients going on though – it almost felt like having a pen-cai that I wished for more actual soup-soup. There were some ingredients that I appreciated – they were cheap ones though, such as the soft bamboo shoots and crunch water chestnut. Thankfully, the innards were expertly prepared and cooked, leaving no unpleasant taste. Also noted those ‘round things’ within. I had an inkling what they might be, but asked the waitress to confirm. ”Oh, these are balls from the 鸡鸡 (chicken)… only the rooster has, not the female.”, she chuckled. Oh. The Chinese believed that eating such parts would aid in… emm… manhood. But I wasn’t overly comfortable with having them. 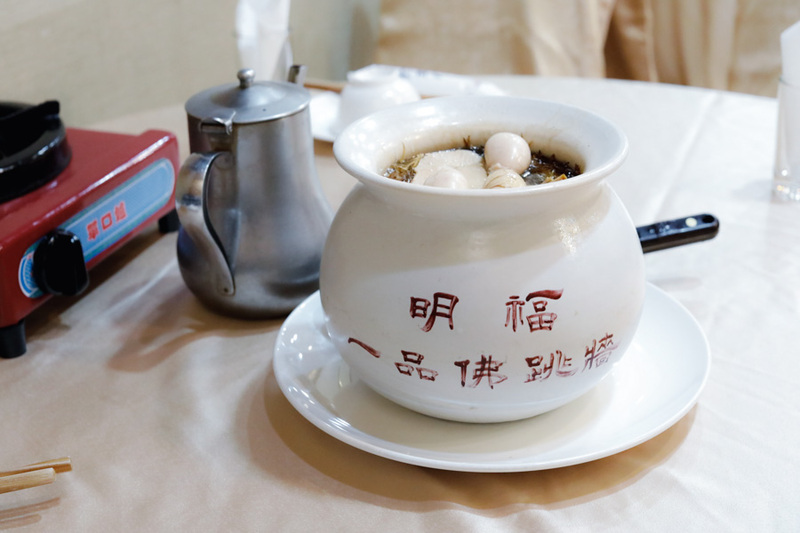 Other signature dishes include Glutinous Rice Chicken 糯米雞, which is a whole chicken stuffed with steamed sticky rice, braised and served with pickled gourd and some chicken broth, as well as Beef Brisket Stew 清燉牛腩, Chicken Testicles and Pork Kidney Cooked in Sesame Oil 麻油雙腰, Barbecued Small Abalone 燒烤九孔, and Barbecued Sausage 烤香腸. 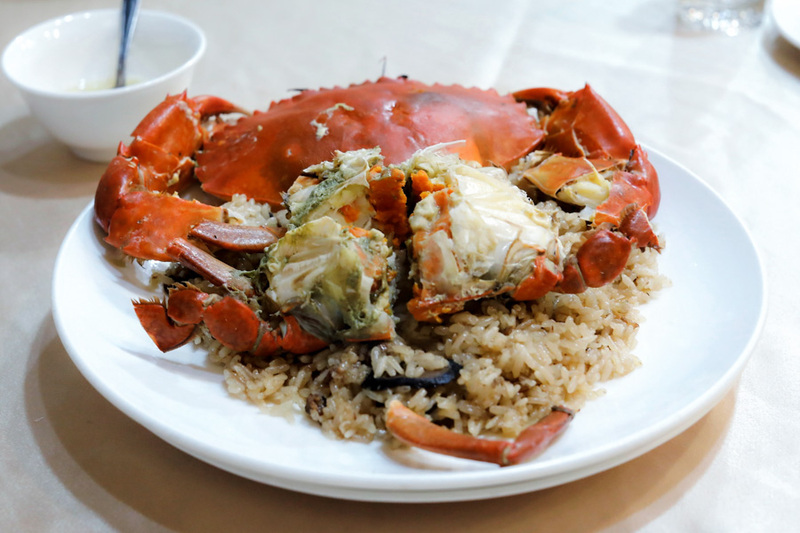 Another popular dish I had to pre-order was the Steamed Glutinous Rice with Crab 紅蟳米糕 (seasonal price), of sticky glutinous rice topped with freshly steamed crab. 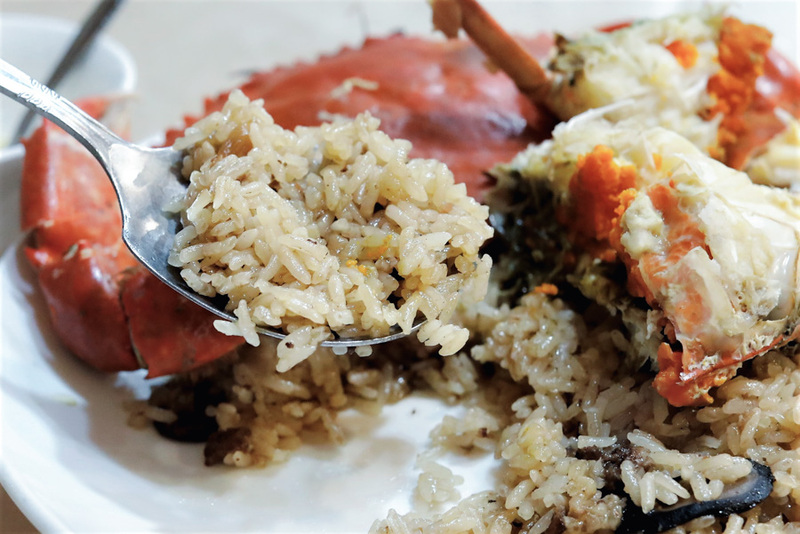 The rice was soft, not oily, and flavourful as it had absorbed the natural juices of the crab. 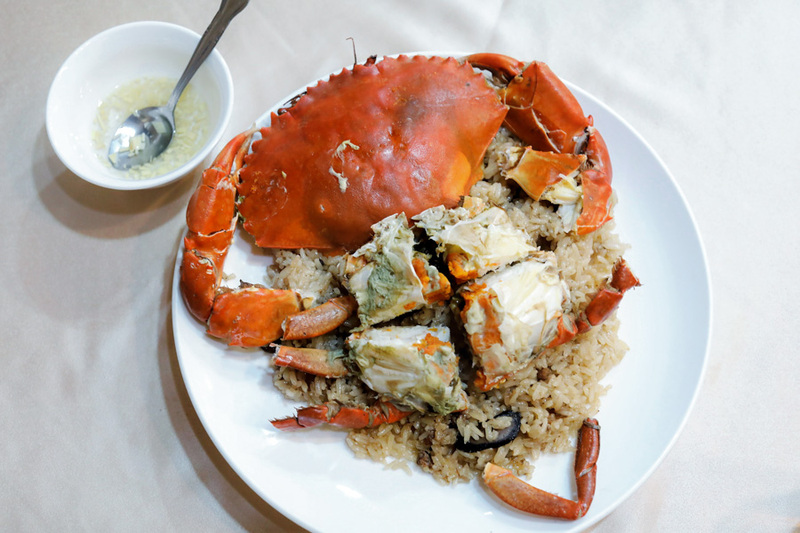 The crab was also a gem, moist and dense of bright orange roe that could get you licking on your fingers. 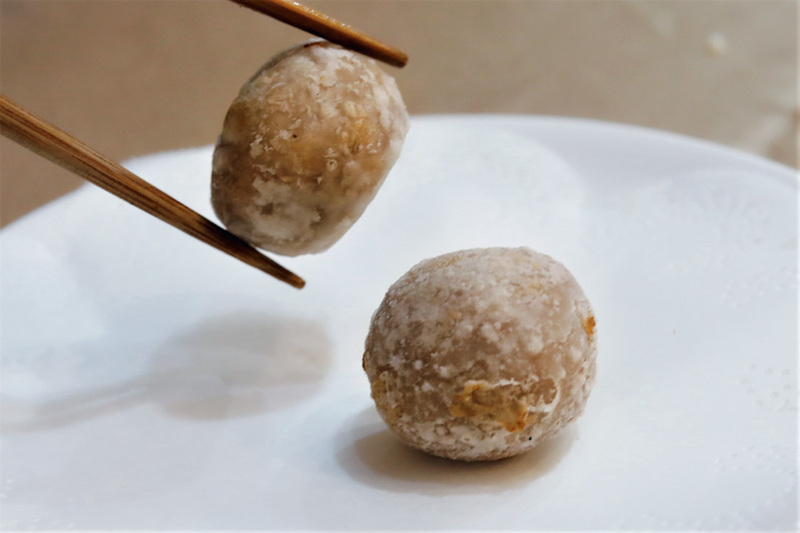 To end your meal, try their crispy Fried Taro Balls (NT$210, SGD9.26 for 7 pieces), which are glutinous cake balls stuffed with a sweet red bean paste. 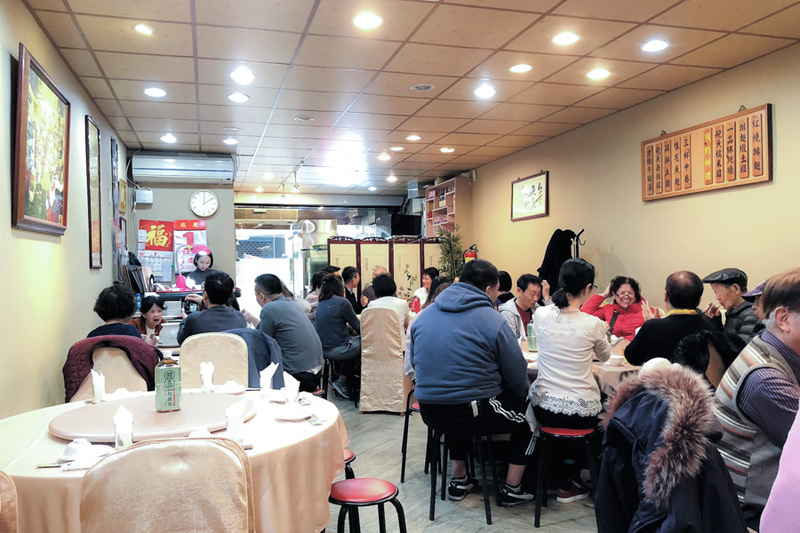 Dishes are priced from NT$500 to NT$1500, which is rather pricey compared to other similar establishments. But top notch quality food has its price, and many diners swear the dishes are worth the price. Prepare to spend NT$1000/1500 for an a la carte lunch or dinner, or about SGD750/800 for a table of 10 if you order most of their signature dishes. As the tables are limited, it’s a must to call for reservation. Make your appointment way in advance as it could be booked for months since it’s been awarded a Michelin star. Menu is not available in English, so it’s best to bring your Taiwanese friend along.